Chew on this: Squid and Roast Pork Vegetable Stir-fry recipes that sing out loud. Clean and peel the squid. Separate the tentacles and hood. Slit the hood to open it up flat. With the tip of a knife, cut diagonal lines on the inside of the squid. Then make diagonal lines in the other direction to form a crisscross pattern on the squid. Bring a pot of water to boil. 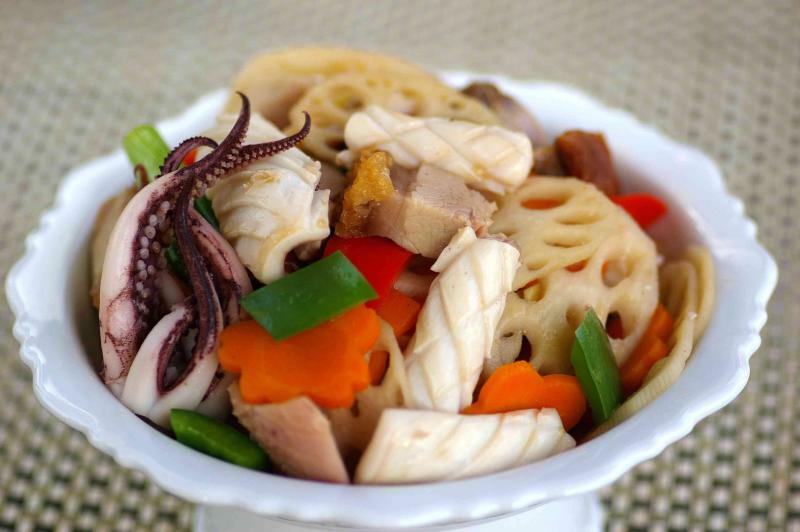 Blanch the squid, then the lotus root slices and carrot in boiling water briefly. Remove and drain well. Heat the oil and sesame oil in a preheated wok over medium heat. Add garlic and ginger, and stirfry until fragrant. Add roast pork and fry briskly over high heat. Sprinkle in a little water during the frying. Add in the squid, chillies, the rest of the ingredients and seasoning. Stirfry briskly until well combined. Toss in the spring onion just before dishing out.